Sony has announced their fall sale by way of the PlayStation Blog. The event is set to run a full week and offers two sets of discounts to two sets of consumer bases. If you’re a PlayStation Plus subscriber, you’ll be able to get all the games on sale for 50% off their original prices. Regular PSN members will enjoy a 30% discount. Looking at the list above, I’d say the biggest must-have on deck is Limbo. The game was once an Xbox LIVE Arcade exclusive, but its quality practically demanded it be spread to other platforms. It’s an experience like none other I’ve ever played, and it comes with a really unique story. If you’re a PlayStation Plus member, the $7 price tag is a steal. 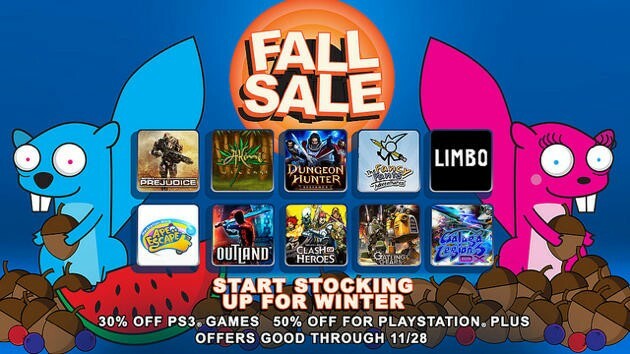 Will you PlayStation 3 owners be snagging any of the deals above? Or do you think this sale is rather ho-hum?